Marc Stevens is a native of Charlotte, North Carolina and attends Weddington UMC. He is a graduate of the Business Management School at North Carolina State University. Marc has been a Business Advisor for 18 years, the twelve years for BB&B Insurance Services. 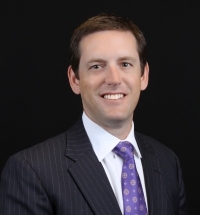 He is responsible for producing and managing Health & Welfare plans for BB&T and their respective business clients. Marc, with his wife Ellen and their two boys realize that they are blessed and therefore enjoy giving their time and energy to those in need. Their collective efforts are primarily directed to helping low income/high risk children, the homeless and breakthrough cancer research. Concerning his involvement with non-profit organizations, Marc served on the Board for Apparo (formerly NPower Charlotte Region). He was a director for six years and was the Treasurer and Finance Committee Chair from 2008 to 2013. Marc has been a Little League and YMCA Coach, actively plays Church league basketball and enjoys running and snow skiing.